Arizona’s growth continues to surge, with a 2019 census report estimating it was the fourth fastest growing state last year. The report, which estimates Maricopa County had reached more than 4 million people by 2016, said population growth in five Western states has surpassed other regions for seven decades. When driving down the roadways, people may notice cyclists in bike lanes, on sidewalks and even riding in front of us on the road. Deputy James Allerton with the Pima County Sheriff's Department said even though they're everywhere, that doesn't mean they're allowed to be. "Cyclists have a lot of the same laws that they need to follow as motorist, obviously bicyclists are a little different, but you still need to follow the motor vehicle laws as a bicyclist," Allerton said. If there is no white line, the law states cyclists are allowed on the road, as long as they're still following the traffic rules. An Arizona man killed by an exploding Takata air-bag inflator brings the worldwide death toll to at least 24. Armando V. Ortega, 55, of Yuma, died June 11, 2018, three days after his 2002 Honda Civic was involved in a crash near Phoenix, according to the Arizona Department of Public Safety. Arizona lawmakers continue to push for a statewide texting and driving ban and the issue will once again be discussed at the state capitol. The recent jolt of energy for this issue came almost three months ago after Salt River Police Officer Clayton Townsend was struck and killed by a driver who told authorities he crossed four lanes of traffic because he was texting and not paying attention. The driver, identified as 40-year-old Jerry Sanstead, has not formally been charged in the case to date. Arizona is one of only three states in the country without extensive texting while driving laws. Only a few cities in the state have passed ordinances against texting and driving. If you get behind the wheel in Arizona, you are automatically giving law enforcement consent to test you for driving under the influence, according to two new rulings from the state's high court. The Arizona Supreme Court issued opinions on two DUI cases questioning whether drivers gave their consent for officers to perform breath tests. According to state law, when someone drives in Arizona, he or she is giving consent to take blood, breath, urine or any other test of bodily substance to determine alcohol or drug content. Alexis Diaz was arrested on April 2, 2016, and later charged with DUI, according to court documents. She was read her rights and agreed to take a breath test, according to documents. In court, she argued she had no choice but to agree or lose her license so consent was not really voluntary and therefore her rights were violated. Ride-sharing service Lyft on Tuesday announced a new initiative called Lyft Driver Services that aims to give its Arizona and national drivers economic flexibility. The three-part program was put in place to “help drivers succeed on their own,” according to a press release. “We believe it’s our responsibility to make Lyft work for anyone striving to provide for themselves and their families in this economy: veterans, immigrants, parents, seniors, millennials, artists, entrepreneurs,” Lyft Chief Operating Officer Jon McNeill said in a press release. Why Do Arizona Driver’s Licenses Last So Long? Arizona law states that a driver's license doesn’t need to be renewed until the driver turns 65 years old. The were set by Arizona lawmakers decades ago, and in 1999 state legislators actually voted to extend the renewal age from 60 to 65. “That was a choice to presumably make it more convenient for people to not have to go into a MVD (Motor Vehicle Department) office every several years to renew a driver license,” said Doug Nick, spokesman for Arizona MVD. While newly licensed 16-year-olds may think they’ll have the same physical licence until 2068, that’s a misconception. Arizona residents are required by law to update their license photo every 12 years. Although it’s not a legal requirement, many choose to update their license when they turn 18-years-old and again after their 21st birthday. Retirees who move to Arizona will see an expiration date more in line with the rest of the country. Your Arizona driver's license or ID won't get you very far after October 2020. There are about 400 business days until the Travel ID deadline. Your standard license won't be accepted at the airport after that date. “I mean that makes no sense,” said Chris Arlig waiting at the MVD. Some people are feeling surprised and frustrated after hearing the news. The federal Real ID Act of 2005 boosted requirements for airport checkpoints and federal buildings. The MVD deals with 7300 people a day in Arizona and many of them may want to upgrade to the Travel ID before the deadline. 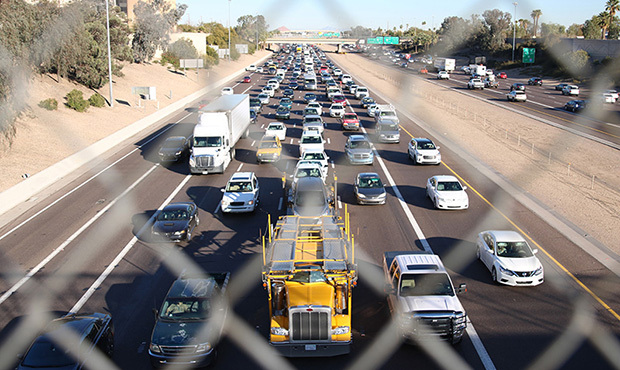 The number of deaths recorded on Arizona highways this year has reached 80, but many of them were preventable, authorities said. “It’s tragic,” Arizona Department of Public Safety spokesman Kameron Lee told KTAR News 92.3 FM on Friday. “This time last year, we were at 65, which again is tragic, but we’ve increased from this year to last year,” Lee said. The department does not know for certain why deaths on the highways have increased, but Lee said one reason could be more drivers on the road, especially those traveling north to see winter weather.